Dupont Circle is a traffic circle, park, neighborhood and historic district located in the ‘Old City’ of Washington, D.C. Connecting three main avenues, the circle lies at the center of New Hampshire Ave, historic Massachusetts Ave, and Connecticut Ave, which radiates from the White House itself. Along many of these connecting roadways, you will find rich history, things to do, and places to eat. Here’ our guide to some of the best restaurants in the Dupont Circle area. Komi is one of the best fine dining restaurants near Dupont Circle, presenting a unique experience of American–Mediterranean dishes perfect for any special occasion. Each plate is creatively crafted and presented with an optional wine pairing. The expertly trained staff will explain the making of the wine and your meal in a one of a kind way to learn and enjoy the origins of what you are presented with. Composed of three late Victorian townhouses linked via internal passages, the Tabard Inn provides a glimpse into the past. For dinner, you may want to enjoy a starter of blueberry soup followed by a jumbo lump crab cake with tropical fruit, watercress, and citrus vinaigrette—after which you can retire to the fireplace lounge with a glass of brandy. The lounge features live jazz every Sunday, Monday, and Tuesday night. The most popular meal at the Tabard Inn is undoubtedly brunch. The brunch menu includes a complimentary fresh bread basket and options such as donuts. Restaurant Nora is known as America’s first certified organic restaurant, with at least 95% of all ingredients produced by certified organic farmers, growers, and suppliers. Nora Pouillon, a native of Austria came to the U.S. in the 1960s and, seeing the processed, chemical-laden foods Americans were eating, jumpstarted the farm-to-table movement that so many restaurants have now adopted. Restaurant Nora was a part of her crusade to promote a healthier lifestyle. You can choose to order your own dishes from the list of small plates, salads, and main courses. Alternatively, opt for the three-course tasting menu with desserts like molten chocolate cake with cappuccino ice cream or white wine poached pear with ginger ice cream and chocolate sauce. Firefly serves American comfort food made with seasonal ingredients in support of local farmers. From the salvaged barn-wood tables and recycled wine bottle glassware to the cork recycling program, there are countless touches that reflect Firefly’s commitment to sustainability. While the restaurant is open for breakfast, lunch, and dinner, Firefly is another popular brunch spot especially for people staying at the Hotel Madera, in which the restaurant resides. Try pumpkin pancakes with bourbon pecan caramel sauce and cinnamon cranberry butter or biscuits and gravy with cream biscuits, half-smoked sausage, sawmill gravy, and home fries. Rasika is an upscale restaurant and lounge featuring some of the best modern and authentic Indian cuisine in the Washington, DC area. Dishes are prepared on the Tawa (griddle), Sigri (open barbeque), or Tandoori style with the traditional use of a clay oven. The menu is extensive, but a few dishes that might catch your eye are the mango shrimp made with fresh mango, cashews, ginger, and coriander; the lamb xacuti made with coconut and roasted spices; or the sweet potato samosas made with ginger, green chili, and cranberry chutney. 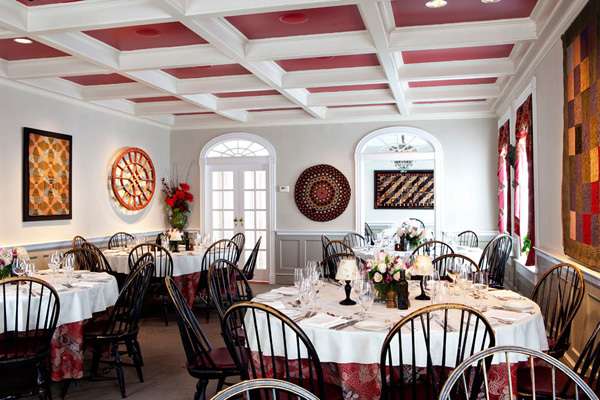 The menu is full of flavors with beautiful decor to match—jewel tones, striking Indian art, a combination of dark and light woods, and a centerpiece ceiling made to resemble the banyan tree that holds an important role in Indian culture. Rasika also features a menu of international wines and a list of creative cocktails reminiscent of Indian spices. Al Tiramisu is an authentic Italian restaurant established by award-winning chef from Basilicata, Italy Luigi Diotaiuto. Al Tiramisu serves savory dishes like a house made fettuccine with veal ragù, linguine with clams, garlic, and olive oil, grilled salmon with orange sauce, and duck breast with balsamic vinegar and honey sauce. The dessert menu offers enticing items like custard with mixed berries, semi-sweet chocolate mousse with candied orange zests, gelato, and of course the Italian classic tiramisu. Hank’s Oyster Bar is a New England style outpost featuring some of the best seafood in the Dupont Circle area. Hank’s serves up a mix of lightly fried items like the popcorn shrimp, calamari, and Ipswich clams that balance out the ice bar options which consist of raw oysters, tartar, and ceviche. Also available are favorites like lobster bisque, New England clam chowder, and lobster rolls, as well as daily specials like bouillabaisse with gulf shrimp, scallops, mussels, Mahi Mahi, potatoes, and saffron-Lobster broth. Hank’s also has an extensive drink menu with red, white, and sparkling wines, a selection of beers and creative cocktails like the Hanky Panky served up with citrus vodka, house-made limoncello and a splash of sparkling wine. Ruth’s Chris Steak House is reminiscent of an English Tudor castle, complete with winding staircases, small, romantic nooks and an enclosed patio overlooking the street. The menu features a selection of signature USDA prime steak in addition to specialty entrees like barbecued shrimp, stuffed chicken breast, and Caribbean lobster tail. Enjoy desserts like caramelized banana cream pie, bread pudding with whiskey sauce and chocolate sin cake. Bistrot Du Coin is a bustling neighborhood restaurant boasting the motto ‘French, Fun, and Friendly.’ With vintage poster decor and French speaking staff, Bistrot Du Coin offers an authentic, cozy and unpretentious French bistro that focuses on good food. There’s an extensive menu and over 10varieties of mussels. The bistro is also known for its parties; they celebrate famous French events such as Bastille Day on July 14th, the Beaujolais Nouveau event on the third Thursday of November, and the New Year’s Eve party. Bistrot Du Coin also has an extensive drink list with French cocktails, like the Sacre Coeur mixed with absolut vodka, champagne, and hibiscus candy flower or the La Belle Normande crafted with calvados, rum, apple nectar, orange juice, and cinnamon. For the Thai enthusiast who enjoys food that is authentically spicy, Little Serow offers a true selection. Enjoy seven courses from a preset menu that changes from week to week. Some favorites include the tofu with ginger and peanut as well as the mushroom basil and egg. The staff is friendly and the atmosphere is small and intimate, accommodating parties of four or less. Along with the authenticity of the ingredients themselves, guests are encouraged to eat in the traditional way, with their hands.